It’s like this whooshing thing, and it’s coming in my windows and it feels nice. OMG, it’s a cool breeze! Thanks to a crazy scary thunderstorm that flooded parts of campus and knocked the power out to the nearby shopping district last week (I watched the grocery store clear out carts and carts full of meat and dairy after they lost refrigeration), the heat in Pittsburgh finally broke. Which means…knitting with wool! 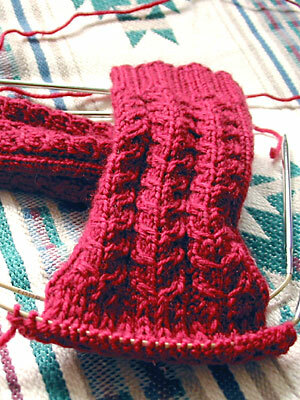 Not only have I been working on the Curved Shawl*, I also busted out the long-neglected Denmark socks. And much to my surprise, they seem to have been knitting themselves over the summer. I thought I was only halfway done with the leg, but it turns out I’m ready for the heel flap! Have I not been paying attention around here, or have you not told us what yarn that is? I couldn’t remember if I mentioned the yarn either, so I had to look it up. A-ha! I did make mention of it when I first started the project way back when. Anyways, it’s Jaggerspun Zephyr in Cinnabar. CogKnition posted this on August 15th, 2007 @ 5:36pm in Unfinished Objects | Permalink to "Flappity Flap"